5 small changes I’m making to save over £1000 this year.. It hasn’t been easy saying NO. Every trip to the supermarket is quite a challenge when having to stick to a very small shopping list. Gone are the days when I’d get a trolley full and spend £75! Today my weekly shop came to £10.44. 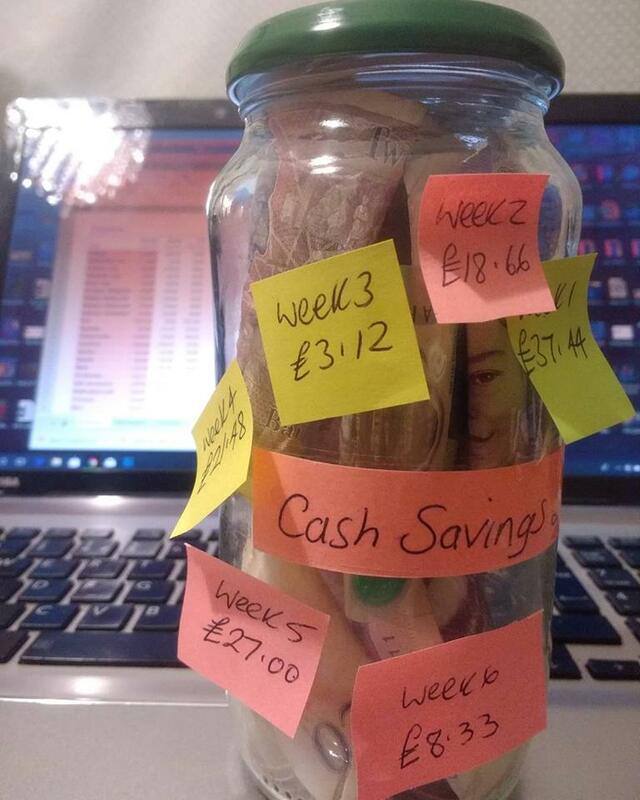 The great news for me was that at the end of the day when I did my spending calculations and counted the money in my purse, I had underspent for the 6th week in a row and was able to put £8.33 into my cash emergency/savings jar making a grand total of £116.03p! Tonight is going to be a challenge, my weekly household/entertainment budget will be truly stretched as 18 of us ladies are attending a ladies night event at Carlton Park Hotel. But I’m on a roll and I know my £15 weekly budget will suffice! I’m determined! You may have read in some of my past posts about some of the smaller changes I am making that add up to quite a bit at the end of the year…. here are some of them. I am using an EcoEgg detergent free laundry egg with great success! So far I have been really pleased and its doing its job! I do use a stain remover spray which I already had, for anything that is heavily stained. The EcoEgg saves me £57.39 p per year – here is the review I wrote about it. I am using a Crystal Deodorant Mineral Stone rather than my normal roll-on deodorant saving me £33.50 a year (it pays itself back after the first couple of months). This works really well, there is a knack to applying it. Run the stone under the tap for a second, shake it to remove excess water, apply to under your arm rubbing back and forth like you would a normal roll on but instead rub it back and forth about 20 times covering all areas of the armpit. Repeat the process on the other side. I’ve not had a smelly pit yet! I’ve switched my mobile phone Giff Gaff Goody Bag from £20 a month to £10 a month saving myself £120 per year. I cancelled my Platinum level Natwest Account and moved to their FREE bank account. I was paying £17 per month with the Platinum Account. The benefit I lost was roadside assistance/breakdown so I signed up to GreenFlag at £5.75 per month. This works out as saving £135 a year! Just these 4 changes alone will be saving me £345.89 this year! A BIG EXPENSE I was prepared for..
My 19 year old car went in for it’s MOT on Monday. I knew if she was to get through her MOT it would end up being expensive as she has been suffering with corrosion. The last four months I have been putting at least £100 a month into a sinking fund for my car. Infact the amount of money I had put aside was £480.03 (not sure why there was a 3p but there was!). 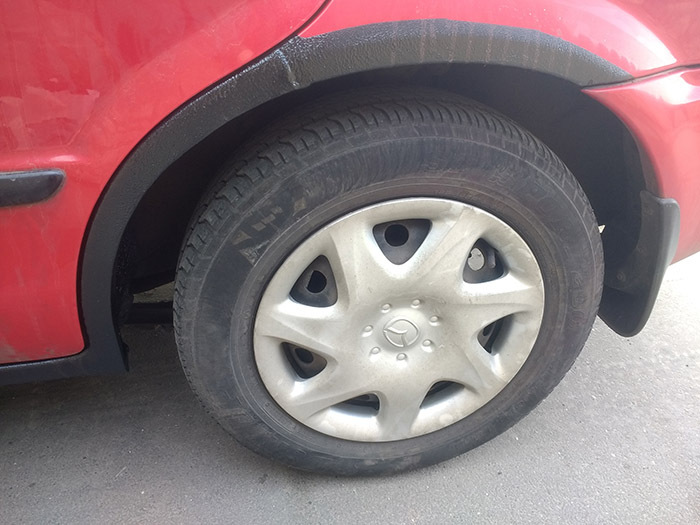 Poppy needed nearly £300 worth of repair/welding, she failed her emissions so the engine needed treating, her front drivers tyre needed replacing, the headlights needed adjusting and the wiper blades needed changing. To save money with the repair/welding I had the treated wheel arches hand painted with black instead of rubbed down and resprayed. 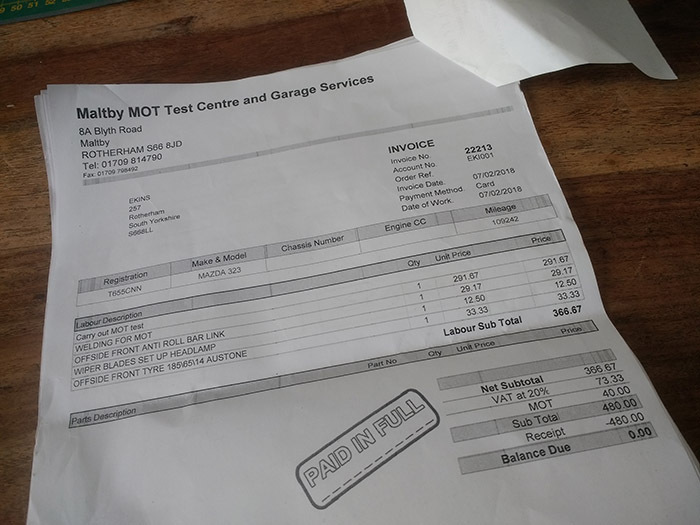 In total, including the fee for the test, the bill came to £480. My car is worth about £400, I could probably do without her at a push as I live just 2.5 miles away from work but I do have other responsibilities that take me further away. So I had the work done. It was difficult to lose all that hard earned and saved £480 in one go but I reminded myself that I had saved for this eventuality and imagine what a pickle I would be in if I hadn’t started saving! Despite the big bill It also felt good that I was able to pay for it without worrying how I was going to find the money for it! I’m happy I have my car back. I’ll continue putting money into a car sinking fund every month as I fear that next February it will be time to find myself another car. So looking at the 4 small changes I’ve made above AND the amount I am underspending every week by sticking to my shopping list and planning ahead I’ve worked out that this will save me over £1000 this year! What changes are you making to save money, get out of debt and put some money away for a rainy day? These are all great things! I’ve got to start working on our budget this weekend. Groceries are our biggest problem, and I know I can improve on that! Love your blog! Thank you!!! Its really surprising what can be saved just by making very small changes! I’ve just found a coffee I really like that isn’t Starbucks House Blend (£3.50 per bag)…it’s Tesco’s French Coffee at £2.25 a bag. I figure seeing as I buy a bag a week thats £182 a year (Starbucks) and only £117 a year (Tesco) that saves £65 in a year. Well I think I’m going to half my coffee consumption and buy 1 bag every two weeks instead therefore saving another £58.50. That makes £123.50 saved in total which is over £10 per month! And that’s just coffee…. 🙂 Heehee! This is great. I see that you planned for car issues and that worked in your favor in the end. It’s so good to plan for those inevitable fixes when one drives an older car. I recently purchased a new car after driving a 17 year old car that was no longer worth the repairs. In the end we donated the car to charity. I am enjoying the new car, and even though we don’t have to worry as much about anything other than routine maintenance, a car fund is always a good idea! 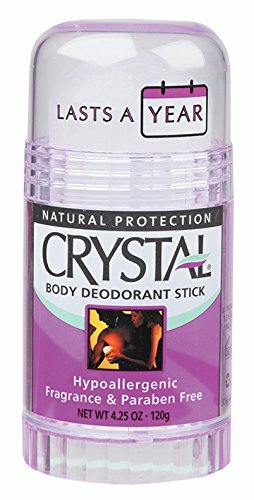 I want to add that I have been using the Crystal deodorant roll on for years now and I agree that it works well. I don’t know how it does what it does, but I have had no complaints and I feel clean and dry. If any of your readers suffer from sensitive skin, psoriasis or eczema, this may be a good solution for them. I have had eczema all my life and prefer gentler creams, lotions, and deodorants made for these conditions. Small changes are really important and they sure add up. I have been watching a BBC TV series called EAT WELL FOR LESS. Very interesting and if nothing else it makes me feel sooooooo good about the choices we have made and the way we live. It is about British families but I know people just like them here in Canada. The concept is two guys (one a green grocer) help people learn better ways to shop and prepare meals because they are just insane with the amount of money they spend, the amount of food they waste and the poor nutrition they get. Some good recipes as well and I have learned some things, particularly about meat cuts. One part is switching out the brand name products that people are hooked on for cheaper or store brands but of course keeping the labels hidden. Truly amazing that people cannot tell whether or not the tea, tuna, cola, beer etc etc that they have been using or years has been changed. Not only can they not tell but when it has NOT been switched they don’t like their so called favourite. I am definitely going to use this as my husband tends to be quite brand happy. I already did a switch a few months ago with Ketchup. The new brand does not have corn syrup in it so much healthier and tastier. I did not hide the label but this was an example of manlooking. The bottle was right there in the fridge starring at him. He noticed the change about a month after we started using it and was surprised because he had been thinking that the ketchup tasted more like tomatoes. This will save us $1.60 a bottle which will be $4.80 a year. Another important small saving that can be done is with unit pricing. Often the large packages of items works out to be cheaper than the smaller package when you calculate the cost per unit (i.e. every 100 grams). But sometimes the smaller package is the better deal. For us the problem was that although the unit price was cheaper we did not have $10 or $20 to buy just that one big item that was more than we really needed at one time. This is when we started Share Shopping. I did this with family, friends and neighbours. We would agree on what to buy and then share the package benefiting from the cheaper unit price. Worked really well and we saved a lot. Unfortunately I no longer have anyone to share with as everyone we live close to now has very different ideas about food and cleaning products etc. Share shopping does sound like a great idea for buying in bulk and saving money! Well done, you really are doing well. I also swapped my £20 giff gaff goody bag for the £10 one and didn’t even think that that one switch saves me £120 per year! So I thank you for that little boost. It MAY be worth hiring a car for those occasional longer journeys, when your car does eventually go kaput. By the time you’ve repaired it, paid for roadside assistance, tax, mot, insurance and petrol it gets very expensive, but I am aware that I am very unusual in not having or wanting a car, it’s a little source of pride of mine that I can manage without. Enjoy your ladies night out, I am planning on knitting more cotton wool pad substitutes, I know how to have a good time! I don’t have a blog! I’m not nearly technically minded enough. The replacement cotton wool pad things are just little squares, 14 or 15 stitches wide knitted with cotton, I like them knitted in moss stitch so they have a little texture. If you search ‘cosmetic pad’ on Ravelry they’re there along with several crocheted versions, unfortunately I can’t crochet. I can’t link either, not on my phone anyway, sorry. Sorry you had to spend the car money but very good it was all saved for. You are doing so well. Hi Carolyn, you really are doing well and your efforts are encouraging others of us to do the same, I made my own first ever proper budget following in your footsteps as I have been living on a pension for quite a time and have a credit card debt that I just wasn’t getting on top of. I recently cut my credit card up and am now working on paying it down as fast as I can, it will be good to be debt free . I will have to investigate the echo egg and crystal deodorant and see if they are available here in Australia, they sound worth while , would you put your saved money in a jar as you are doing or would it be better to put every drop of spare cash onto paying off the debt? Please keep us posted on your budget journey and good on you for being so strict with the shopping I know it gets hard sometimes to resist treats. thanks from Judi in Australia. The deodorant crystal will wash away quickly under the tap. It works well if you dap water on your underarms and rub the dry stick on the wetted skin.